Once I had Enlightenment installed on my laptop there was no going back. I tried out a few other window managers, but the efficiency of E16 was hard to beat. My only complaints were that Enlightenment seemed a bit short on conveniences such as launchers, so I ended up running GNOME stripped down to one panel and the main menu with E16 as the window manager. Meanwhile, I read the descriptions of the new “desktop shell” that the Enlightenment crew was working on, dubbed Enlightenment DR17 (or E17, as I’ll refer to it from here on) and thought it sounded like exactly what I wanted. I should mention that “window manager” isn’t quite the right term for E17. 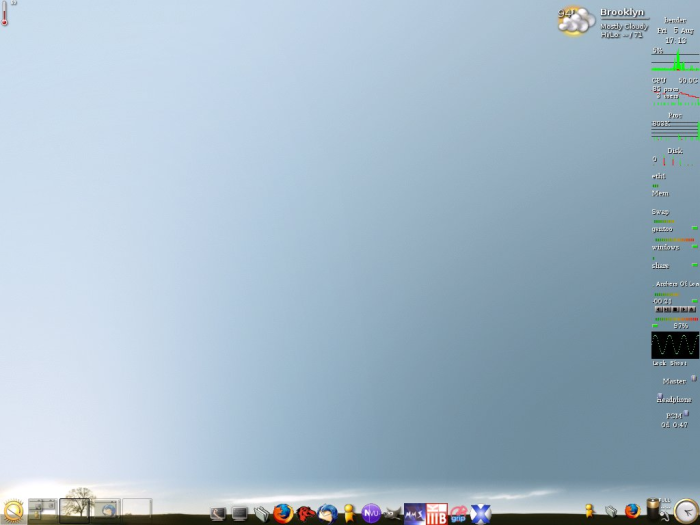 The developers call it a desktop shell, intending it to fill in the space between a simple window manager like the original Enlightenment and a full-featured desktop environment like GNOME. In other words, they were setting out to create a desktop not unlike my own E16/GNOME hybrid. In this respect it does not disappoint. In creating E17 the Enlightenment crew have created a set of shared libraries (the Enlightenment Foundation Libraries) with the goal of building a complete set of applications to create an integrated environment where all files and programs are readily available that remains fast and non-resource-intensive. Essentially, E17 breaks down a desktop environment into its essential components (window manager, file manager, launcher, main menu, etc.) and offers them as a completely customizable package, where the user chooses which elements to use at any time. edge-flipping) or had been there all along (turns out there is an icon box module called ibox, which is disabled by default). 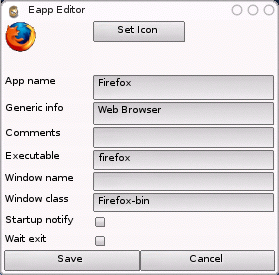 A graphical eap creator and other additions like a run command, alt-tab window switching (complete with a well designed display) and, for those who use sloppy or mouse focus, automatic placement of the cursor in the newly selected window have improved general usability. 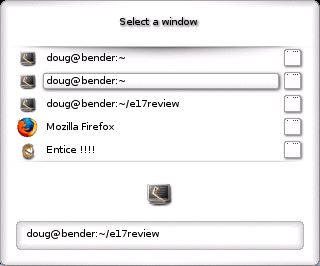 One functional feature of E16 I still miss is using middle-clicks to shade windows. I made an attempt at setting this mouse binding in E17, though what happened was middle-clicking anywhere in the window (as opposed to directly on the titlebar) would shade it, which is problematic when, say, browsing in Firefox and trying to open links in new tabs by middle clicking. Naturally I wasn’t expecting everything to work perfectly — even the splash screen advises “This is development code — be warned!” But to paraphrase someone from another forum, E17 is more stable than your average development window manager. One early issue I had was Firefox behaving strangely with sloppy focus, the default setting. The titlebar would flash in time with my typing, I would lose all of my Firefox-specific keyboard shortcuts, and there would be no auto completion in the URL bar. Perhaps one of the many “minor bugfixes” one reads about in CVS logs took care of it. Another recently remedied problem was the inability to open menus in applications run under WINE. Another curious effect with WINE programs is that any Windows apps opened with WINE (or CrossOver) have the same window-class, which is how Enlightenment chooses what eap icon it uses to represent the app in the taskbar, pager, and window list. While you can set up different eaps with unique icons for each application (useful for the menu), they will all appear with the same icon in the pager (not so useful). Annoying, though likely not a deal breaker for most users. click-to-raise only works on titlebar under mouse/sloppy focus, while click-to-focus works anywhere in the window. I remember someone writing that one of the biggest considerations in your choice of an OS or window manager was answering the question, “Does this help you get your work done?” For a short time last month I switched back to Fluxbox, as I found minor things like focus issues distracting while trying to work. But while writing this review, I’ve found that those minor issues are either fixed or there are workarounds, and E17 has become my standard desktop again. I recently loaded up E16 on the home computer and was struck by how inelegant it is compared to E17. And so I have stayed with the new Enlightenment. Bugs are fixed, people are creating new themes and icon sets, the user guide at Get-E is becoming ever more detailed, and of course, since this is Linux, there are plenty of opportunities for users to join in and make the damn thing better still. 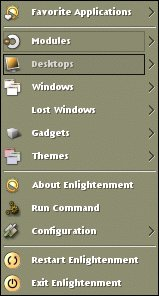 As far as installation goes, you can manually configure, compile, and install following the directions at Enlightenment.freedesktop.org, or you can avail yourself of a few less labor intensive options. Packages are available for Debian, rpms for Fedora, and ebuilds (both snapshots and CVS) in portage for Gentoo. More information on installation can be found here. I use both the Fedora rpms and Gentoo ebuilds (from CVS). At the rate E17 is updated, last month’s version is already rustic. I tend to update it every other week. Thus far, I have had no upgrades leave me with an unstable or unusable E17. are included in the basic installation, you will want to create more. included in the e_utils package. Ideally, you should only have to build a set of eaps once, plus a number of prebuilt eap collections are available online at www.get-e.org. You then organize menus and launchers by editing text files or using the graphical tool Entangle. Additional configuration is done with the main menu , the background chooser Emblem or the command line tool enlightenment_remote, which is by far the most powerful of the configuration tools available in E17. With it you can set backgrounds, themes, focus policy, virtual desktops, modules, mouse button bindings, key bindings, fonts, menu display speeds, edge-flipping, and more. Graphical tools for key bindings, background creation, and general configuration are all on the TODO list, along with items like desktop icons, tabbed windows, and other monitor modules, so there are plenty of opportunities for coders looking to get involved. 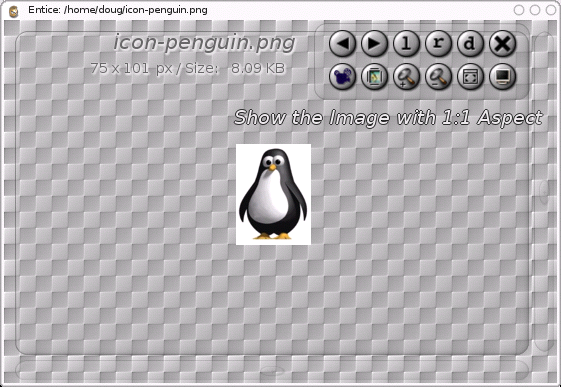 Themes and backgrounds also have their own unique file format that allows a file to include multiple images and scripts, which makes some fun effects possible, such as title bar animation during focus changes, light effects in backgrounds and full-screen animations. A number of themes and backgrounds are available at www.get-e.org. 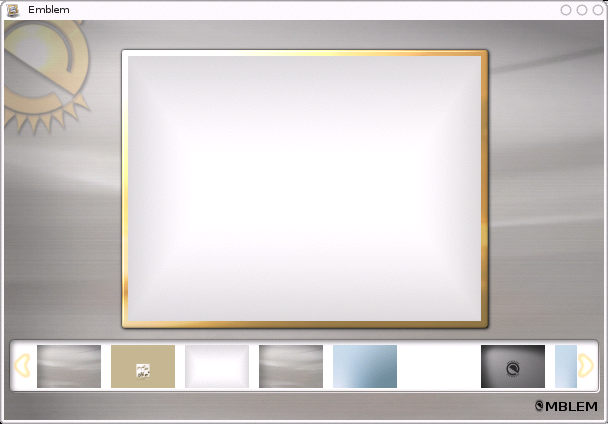 Static backgrounds can be generated from any normal image file. The following is a short flash video demonstrating a few of the animated backgrounds available, as well as one of the desktop switching animations. 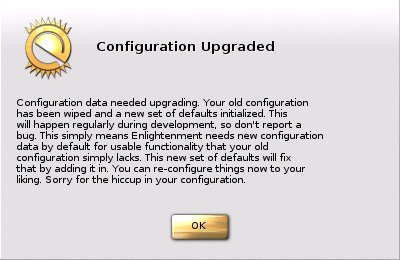 The one nasty little surprise that often awaits a user after an upgrade that is your configuration is reset. What this means is that your module, theme, background, and key binding settings are all lost, though these can be easily restored by writing a simple script. Also, as development progresses, E has become better at remembering some settings (menus, weather url, module placement, startup programs, etc. ), which makes for less work to restore your desktop. Eap files, menus, and launcher configurations are not affected by updates. special mention is Evidence, essentially an graphical file browser, though a bit more flexible than say, Nautilus. 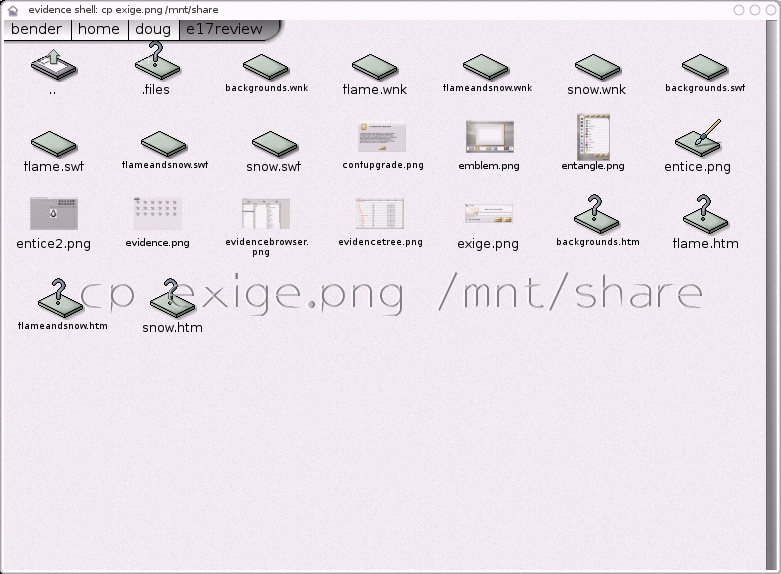 It offers a choice of views (icon, browser, or tree), customizable context menus, and a command shell. The context menu includes options for various file types, such as opening image files in Entice (the E17 image viewer) or editing ID3 tags on mp3 files. Also, you can use the shelf (a frame at the bottom of the main window) to store often used files or application launchers. Evidence can also be used to draw the desktop. 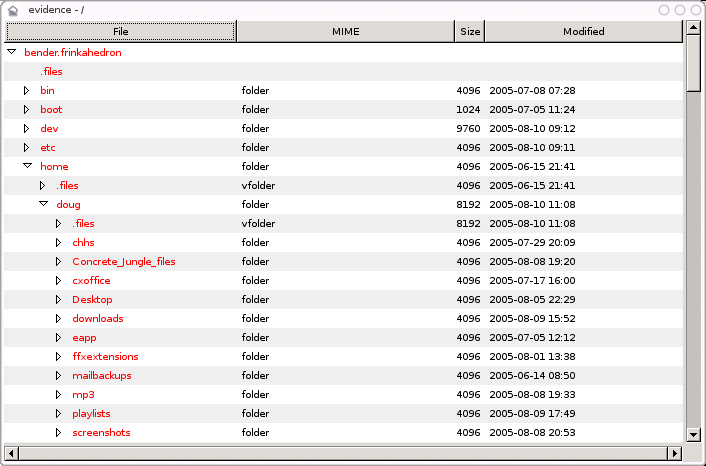 remarkably more stable and functional in the past month alone, I foresee this become my full time file manager. You can use Evidence in any window manager. Visit the Evidence home page for more information. Possibly the most popular of the new EFL applications, or at least the one asked about most frequently on various forums, Engage is a combination app launch bar, taskbar, and system tray similar to the dock in Mac’s OS X. Engage is available in two different forms: a standalone form which can be used with any window manager or a module form for use with E17. The standalone version is a bit more robust and configurable than the module form, but I have been using Engage in place of the iBar launcher recently without any troubles, and having the system tray available was quite useful in creating the Wink movies for this review. A number of other applications are being developed as well. Equate is a simple, themeable calculator, Entice is an excellent image viewer that allows for zooming and slide shows, Elation is a bare-bones media player, and Eclair is a music player with playlist support, similar to XMMS. Though these new EFL apps are worth keeping an eye on as development progresses, Entice is the only one I use on a regular basis. On the whole, I am very happy with the new Enlightenment. On their homepage (www.enlightenment.org), the Enlightenment team states “We believe your desktop should not be an eyesore. It should be functional AND beautiful.” They are doing well on both fronts. great review, may i ask how much is e17 memory hog ? I have been using E17 for a while now. But i would really like to know what you have, the applet kind of stuff, in your very first screen. Where did you get the weather module from. E17 does not use a lot of memory actually. 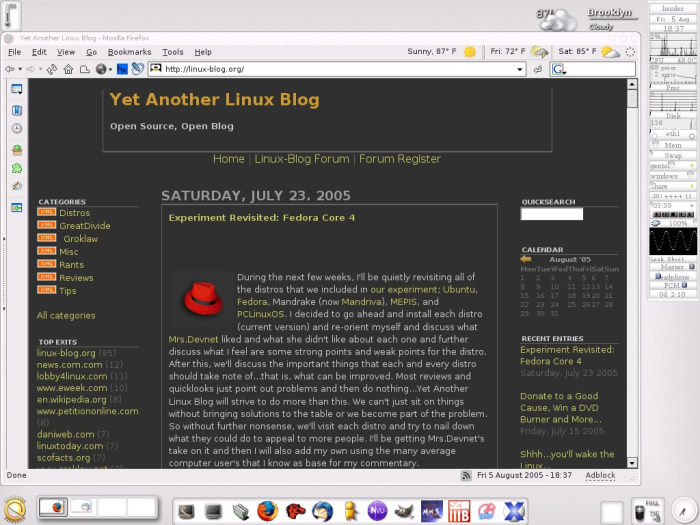 One of their design goals is to make a desktop that is usable on older computers. Plus, you can unload any or all of the modules to reduce the memory footprint further. Typically, I find that E17 uses about 2/3 or less of the memory that GNOME uses, and uses about the same amount as Fluxbox. The first screenshot has the temperature, start, pager, ibar, ibox, battery, clock, and weather modules (CCW from top left) loaded, along with Gkrellm with the ‘invisible’ theme on the right. Weather is in the e_modules package. nice review… i first tried enlightenment (DR17) with vector linux just out of curiosity.. and was blown away..
make no mistake when E17 is officialy released gnome and kde will have a lot of catching up to do..
What is the point of having a flame or snow on your desktop? Could someone explain to me how this improves the user experience? Great and very thorough review, loved the animations. sure E17 is mind blowing and has stunning effects, but a desktop is a compromise between that and integration and usability . In that respect E17 will have more than a lot of catching up with either desktops you refered. I used to download .wavs through a 14.4 baud modem and it would take a hella-long time to download just one wav. Back then, it took all day to download a game that was tiny. What I mean is…start the download and use a download resume (something we didn’t have then either…if you lost your download, you were out of luck) and let it go overnight. 50 Megs is much better than trying to download 650 from the latest distro release to burn to CD. Check it out and see what you think…E17 isn’t bad at all. Also, you can purchase CD’s at osdisc.com for pretty cheap or purchase Vector Linux directly from their site which comes prepackaged with E17. Cheers. Good article, if you haven’t seen it e_utils_eapp_edit has had a bit of a makeover in CVS, it should now have an appearance similar to that of emblem or entangle. I’m not sure what you mean by easy config of modules, is this their placement or other config? If it’s their placement, if you mouse over and hold alt+lmb you can move them around as needed. I updated E the day after this was posted and I like the new eapp_edit look, not to mention the fact it opens up in a usefully sized window. (I used to have to expand the eapp_edit window to see all the fields, though this may have been a local problem.) I see that the iconbox module is included by default as well. Very nice. Edit mode works fine for me — I typically use ctrl + alt + g to start/end it. As far as easy config goes, I was thinking along the lines of being able to change things like the visual appearance without having to decompile/recompile the theme .edj files. Like I said, a minor thing. In case it wasn’t totally obvious in the article, I think you all are doing a great job with E. Glad you liked the post. Hi , E 17 its great, but I still have a icebraker: Ozone Gui. Its small , dammn fast and its fully configurable . Still, it is lacking in one feature from what I can tell. Is there some kind of language switching mechanism for it? So I can move from English to Japanese etc. I assume there is – but for the life of me I have not been able to find what I need to do it. This was a very well written review of E. I have been amazed with E for a long time now (though I havent used it much). But I’m sure once the installation/setup of E becomes easier there will be a lot of converts 🙂 Currently after installing my FC4 without KDE or GNOME, I installed E but eterm is not found, and a whole lot of apps are not found, cos they have not been installed as part of the E install. If only the E install took care of these things or atleast prompted user to install them, using E would be very convenient. Based on the strength of this review, I decided to try out E17. I agree that it’s really outstanding visually. What it does with the small amount of memory and CPU required is really quite remarkable. Unfortuantely, it has a long way to go toward full integration with the underlying distro (Debian, in my case) before I can consider it a real replacement. The use of binary application launchers (the EAP files) presents some big problems in this area. With other window managers, Debian will automatically update system-wide menus when an app is installed. How will E17 accomplish this, and at the same time respect the individual user’s chosen icon theme? This is a problem for other WMs, too, but using text-based application launchers makes it easier for the individual user to deal with. It also has a long way to go to get back to the extreme configurability of E16, which is a big favorite of mine. I couldn’t even figure out how to make a window decoration buttons do horizontal and vertical maximize, let alone some of the other less commonly used operations that I have configured in E16. I expect they’ve got most of these kinds of things in the works for some point in the future. All in all, they’ve done some really great work, especially in the look of the system. But in it’s current state, it would just take too much effort for me to turn it into a productive work environment. I’ll definitely be coming back to E17 in the future, though, when they’ve decided that it’s ready for general distribution. Very nice review. What theme were you using in the first screen shot? The icons are really cool! I’ve been trying E17 for a while now. Have noticed a few instabilities, but it looks great and is much faster than gnome on my laptop. Strangely Eterm doesn’t display all characters in man pages correctly, but I think this is an Eterm config issue as Xterm is fine. The theme in the first shot is called Sharp. The background is called Sky and is actually separate from the theme, but both are available over at http://www.get-e.org in the themes section. 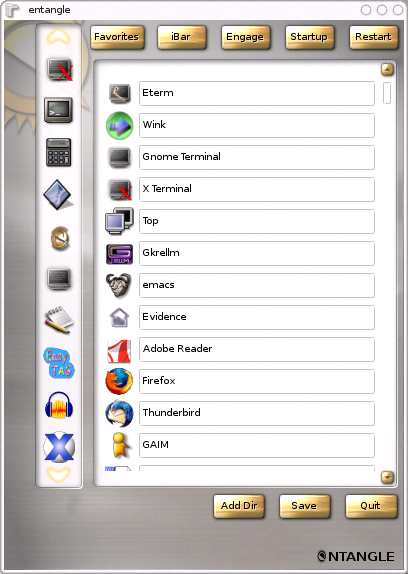 I created the eap icons using mainly the default GNOME icons. It’s really cool. Can you post your icon eaps somewhere? I’ve tried installing a different backgrounds on E17, but the graphical tool Emblem keeps dying on me. Anyone else experienced the same problem? What do I have to do to create my own theme? I’ve noticed I like different bits of the various ones on get-e.org. 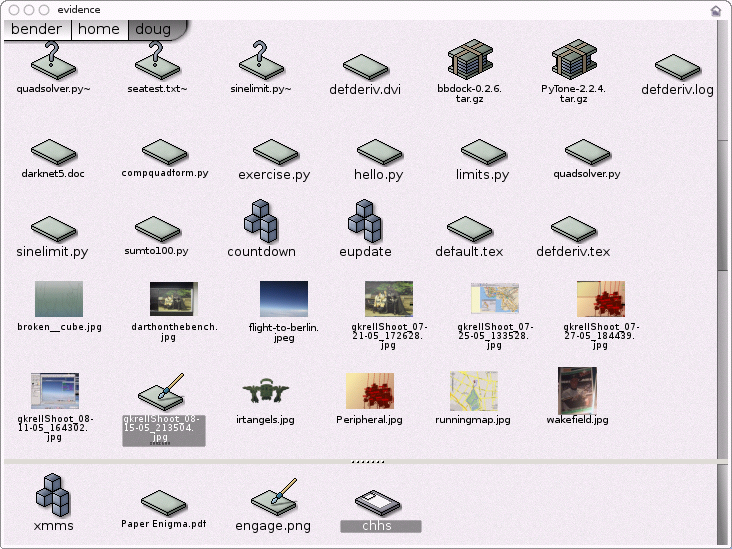 Thanks – I’m a linux newbie, but i really like the E17 eye-candy. Apparently I forgot to put my name on the first reply. If you email me, I can send an archive of my eap files to you. Basically, if you want to start working on themes you can decompile current themes, edit the included files and images (or add your own), and recompile them to make new theme. It would be nice if there was a “distro” of E17 that came all-in-one fully configured package (with all the goodies set up and apps imported from Gnome like Firefox imports IE bookmarks) so newbies could try just it out quickly. I tried E16 and 17 a while back and the eye candy was impressive but went back to Gnome for the functionality. Hopfully this new release moves towards addressing that.. 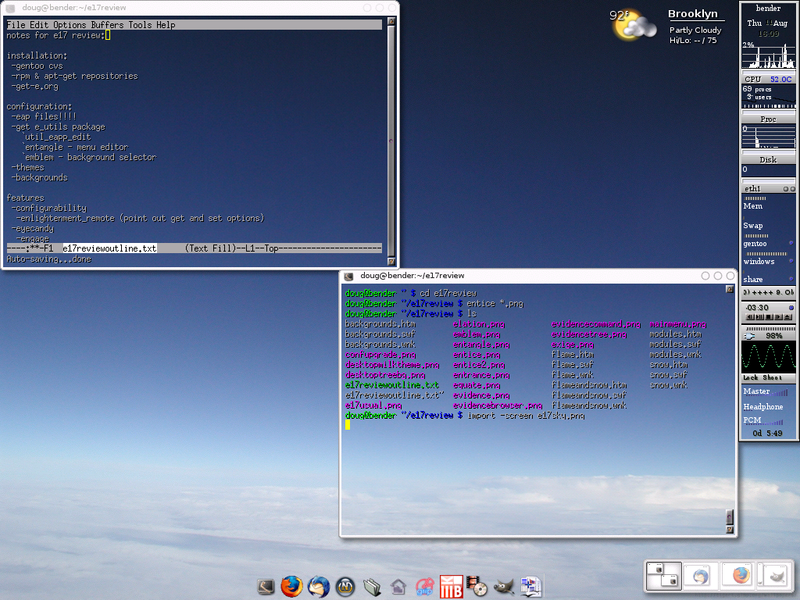 It is a Debian-based live CD distro that comes with both Enlightenment 16 and 17 as the window manager options. The E16 setup is a bit more robust than the E17 version (some of the eap files are misconfigured), but it is an easy way to discover what Enlightenment is all about without the installation and configuration work. Wow.. I just install e .17 .. its pretty darn slick.. Couple things i dont like so far..
1. The keybinding configuration is insane.. this enlightment_remote is way to complex.. we need at least a basic configuration utility..
2. the alt-tab moving the mouse around is very very anoying..
3. When i load an application from the right click menu ( favorites ) it loads the application but does not give it focus on the screen.. grr..
visually its stunning.. I hope they make a wicked configuration utility.. and I sure hope the key-binding stuff is at least as strong as KDE’s.. ( moving windows with key-bindings, etc.. ) .. I use sloppy focus and find this to be quite useful, as when I change windows I want the mouse to follow so that the new window stays focused. I don’t know how it works with click-to-focus. With other window managers, Debian will automatically update system-wide menus when an app is installed. How will E17 accomplish this, and at the same time respect the individual user’s chosen icon theme? This is a problem for other WMs, too, but using text-based application launchers makes it easier for the individual user to deal with. You should check out the *e17genmenu* project on sourceforge as it addresses the issue you just pointed out. Also, the reason why e17 uses binary config files is *efficiency*, avoiding the text parsing overhead ..
AFAIK, it was done as an example of what e17 is capable of. A technology preview. It’s not really useful, just pretty. The use of binary icons and backgrounds allows FAR more benefits (read about them here:_http://get-e.org/User_Guide/English/_pages/3.3.html_) than drawbacks. The _only_ drawback is for direct editing of the file. The GUI tools that will directly manipulate these files are in a big state of flux right now but when they are complete and integrated with e17 they will make it easy enough that you won’t ever NEED to manipulate the files manually. However, there are tools in place already that allow advanced users to do this right now. It will be relatively simple to integrate with systems that auto-update menu systems, etc. since all they generally do is look for .desktop files. There are already tools that allow mass migration of .desktop files to .eap files. All that is required is a system to notify us of an updated file and we can take the appropriate action. The only “official” modules are those that are included in enlightenment by default. Namely: temp, battery, ibox, ibar, dropshadow, and cpufreq. The rest are either outside the E project or in the e_modules CVS module which is just a working area for e17 module developers. Some applications in development by E developers such as Embrace and Engage have module “modes” or options. Yes you can switch from locale A to B using the enlightenment_remote command. Sorry for being so lame but I’ve no idea of linux..I was asked to do some googling on Enlightment and I can’t find some packages for Slack..can you point me to where I can DL them and some installing/configuration tips ? Thanks. you mentioned something about a script to configure E every time you update. Could you possibly give me an example? hey guys, tried e17, looks like i have found what i need. i have a HP Nx 6125 with 1.6 ( 64bit Amd Turion ), 1 gb ram, 60 gb HD, ATi x200 chipset and all the other frills like smart card, wifi, bluetooth, finger print scanner……etc etc. i had faced problems with ubuntu on it, it won’t start x. also with suse there was this cpu fan problem. not much help on the net too. can someone help me with this laptop to have linux on it. I would try Fedora Core 4 (Fedora Core 5 comes out very soon so…might give that a try too). Fedora Core 4 has a 64bit version and a fantastic page for getting it configured. I’m pretty sure that if the folks over at Linuxcertified.com use it on their 64bit laptops that it will work for you too. Very nice article and nice introduction to E17. Just keep in mind that when E17 is finally officially released, it will have most of the configuration tools integrated into it. E17 will be huge! It will wipe the floor with any other GUI ever seen before. We will be seeing a lot of applications that will use it’s libraries once it’s officially out. E17’s graphics libraries are so good that you can write a fully functional DVD player software with just 20 lines of code! Insane! hey ojoi i have got a hpnx 6125..did you get linux to run linux on it? if so which version man…..
Great review! I’ve used ‘ebuntu’ since 16, but didn’t know a lot of those features. Just one thing I haven’t figured out maybe someone can help me with: Firefox, of all my windows, will not remember the proper size and location no matter what combinations of ‘remember using’ I use. As frustrating as that is, I love E.17 so much that it’s absolutely worth it. Do you know, or, have any idea when E17 will be released? Well, considering you reviewed and not PREVIEWED a pre-alpha developing application, e17 has not changed a heck of alot. Evidence has been cut, menus have been re-ordered, modules have been written and about 40% of this article is redundant. There is no release date announced for E17, and I doubt it will be anytime in the near future. However, the current pre-alpha version is quite usable. Many things changed in this time. Do you have a short budget come and feel free to apply on short-term loan; it is more convenient and easy to apply at any time of the day. Keeping you on a budget all the time is kind of like a wrestling match – it takes strength, courage, and at times, a good corner man. The way a sumo wrestler, or rikishi or sumoka, moves his opponent out the dohyo, or ring, you can toss budget emergencies about with the help of short-term installment loans. You don’t want to take on an ugly adversary like financial shortcomings empty handed, and it is for that reason that you must know the Tao of getting through such a situation. If a budget shortfall comes for you, you have to move, turn, misdirect and topple your adversary with the tools at your disposal, and you don’t need years and years of training in order to do it expertly. All you need do to throw surprise bills off their balance is to click a mouse, or use a phone to fill out an easy application, and you can have your cash in as little as a couple of hours. Sumo rikishi requires patience, power, and courage in order to act, and you can have that as well with the help of short-term installment loans. Click to read more on <a title="What is Credit Repair?" href="http://personalmoneystore.com/moneyblog/what-are-…Term Installment Loans. What a great article! Very well-written and thoughtful. I’ve been trying E16 for a while and I’m quite pleased. I’ll definitely take a look at E17 on the strength of this review.